In 2009, the Welling Court community in Astoria, NY reached out to the design house Ad Hoc Art to develop a street art project in their neighborhood. The Welling Court Mural Project was born. Welling Court is located near the East River waterfront on Vernon Boulevard, with a community garden at its center. 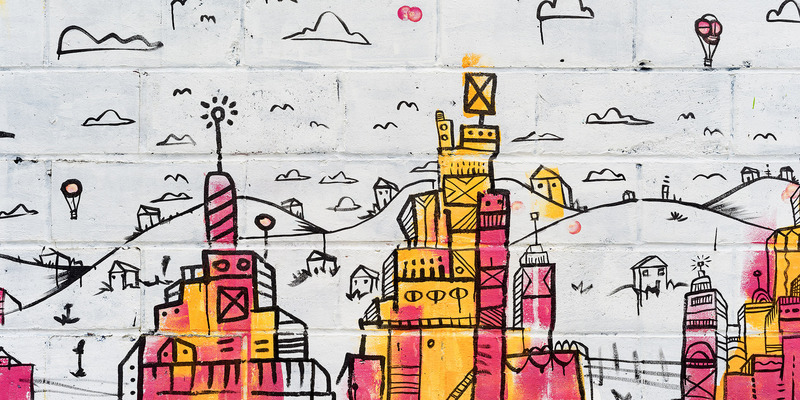 To residents, the rows of brick warehouses and large steel doors that lined their streets seemed like the perfect canvas for large street art murals—and they were right! In 2010, the Welling Court Mural Project debuted its first 40 works of art. Since then, the collection has grown to more than 100 works by nearly that many different artists. We encourage you to take a trip to Astoria to see them for yourself! The Welling Court Mural Project can be found in the streets surrounding Welling Court in Astoria, NY. The murals are accessible any time of day year-round. To get there, you can take the N train to 30th Avenue and walk the remaining mile or so to Welling Court. Alternatively, you can take the NYC Ferry to the new Astoria stop, which is just a couple blocks from the murals. Most of the art is concentrated on the streets highlighted on the map below. Here are some of our favorite pieces from this year’s Welling Court Mural Project. We’d love to hear from you what you think about this year’s Welling Court works. Share your reviews and photos in the comments.